Residents tick off Donald Lim's aide, saying that they don't want leaders who seek publicity from their suffering. PETALING JAYA: Residents of PJS 1 here gave Deputy Finance Minister Donald Lim’s aide the cold shoulder when he turned up at their protest. When Kevin Chong arrived around 10.30am, the residents told him off, saying they do not welcome the representatives of leaders who wanted to seek publicity from their suffering. “When we highlighted the problem to Lim earlier, he told us to deal with the Pakatan Rakyat state government. Why are you here now? “If you want to help, then bring the developer (Peter Brickwords Sdn Bhd) here,” said the residents. Earlier, some 50 residents staged a peaceful protest urging Peter Brickworks to fulfil their demands before trying to evict them. The developer had issued eviction notices to two families residing in the area early this month, which expired today. However, Block E residents action committee chairman M Sugumaran had obtained an interim injunction against the developer and the court had fixed April 27 for the hearing. “We held a meeting with the Petaling Jaya City Hall and the developer’s lawyers last Friday. The developer agreed to retract the eviction notices pending discussion,” said Sugumaran. Calling on the developer to build their low-cost houses as promised seven years ago, he reminded the state government of its pledge that there would be no forced eviction in the state. “We want a written guarantee that our demands will be met,” he said. The residents, who were formerly from Kampung Pinang, Kampung Petaling Tin and Kampung Muniandy, moved to the current place after being promised a low-cost flat in 2003. However, the developer failed to build the flats citing an injuction obtained by the residents on the proposed site for the project. Hindraf Makkal Sakthi pro-tem secretary-general P Uthayakumar, who was present, criticised the state government for ignoring the plight of the residents for three years. “Where is the change you promised? Pakatan claims that Selangor is a welfare state but I do not see any changes in the way it does things. “If the developer fails to fulfil its promise, then the state government should intervne and build the houses for the residents,” he said. International agencies, including the UN, are now more aware of the the plight of the natives in the island. GENEVA: The people of Borneo can rest assured that they are not neglected by the international community. Their woes have been heard by the various United Nation agencies and international organisations. Secretary-general of Common Interest Group Malaysia or CigMa, Kanul Gindol, told FMT in Geneva that dialogues with European leaders and the UN Commission for Human Rights (UNCHR) have been fruitful. “They certainly are listening to our reports and had promised more dealings not only with our governments but also with the people and civil societies, both local and from abroad, who are working to improve the life of the people of Borneo,” Gindol said after meeting with the UNCHR rapporteurs here. Gindol said the international community had not “abandoned” the 19 million people of Borneo, more than half of whom are allegedly living in impoverished conditions. “Leading parliamentarians in The Hague and Brussels told us that they are now more aware of what is going on in Borneo including in Sabah and Sarawak. In fact, a delegation of EU met the Sabah state government officials only a few weeks ago in Kota Kinabalu. The UNCHR was represented in the dialogue by rapporteurs and officers from its various sections, including the human rights section; the economic, social and cultural rights section; the religious rights section; and the indigenous peoples and minorities section. CigMa president, Daniel John Jambun, presented his paper “Disenfranchisement of bona fide Sabahans”, the same paper he had presented in earlier meetings in The Hague, Holland, and Brussels in Belgium. 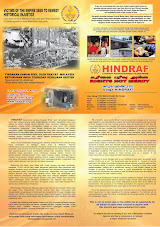 Hindraf leader, P Waythamoorthy, also made a presentation on the condition of Indian community in Peninsular Malaysia. Also joining the dialogue in the UNCHR office in Geneva was Clare Rewcastle-Brown who made a power-point presentation on the recently-concluded Sarawak state election. Brown, who operates the Sarawak Report blog and also the London-based Radio Free Sarawak, highlighted how political manipulation of the simple-minded natives in Sarawak had contributed to the triumph of the ruling Barisan Nasional (BN) in the recent Sarawak election. Borneo Island is one of the most divided islands in the world with three countries – Brunei, Malaysia and Indonesia – governing parts of it. Including the tiny sultanate of Brunei, the island is divided into seven states or provinces – Sabah, Sarawak, West Kalimantan, Central Kalimantan, South Kalimantan and East Kalimantan. All states are endowed with gas and oil deposits, with Sabah, Sarawak and Brunei combined together having one of the biggest reserves of oil in the region. Large tracts of timber are being cleared for large-scale palm oil plantations which has become another big issue for the people in the island. Police Report on Ethnic Cleansing of Hindu Temple & Cemetery, Tamil School and Indian Village @ Bukit Jalil Estate by HRP, HINDRAF & NGOs’ Johor.